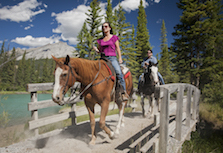 Cowboys and cowgirls have long had a culture that has captivated visitors to Banff National Park. The usual image of taming, trailblazing, and settling lands may somewhat be a thing of the past, but the welcoming and personable guides in western wear is very much the experience guests can expect when visiting Banff Trail Riders. 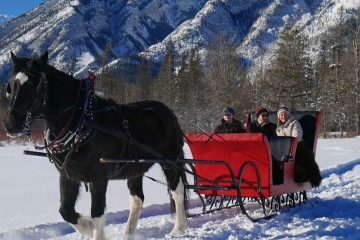 The best sleigh rides in Banff are guided by our authentic locals along with the friendly four-legged staff in a private or group sleigh. Sleigh rides in Banff are the perfect activity for a family or couple while snuggled under a warm blanket in the midst of winter’s silence. Unlike skiing, this activity is the best way to view the mountains hassle-free as our guides steer the horses through the frozen marshlands of the Bow Valley. Wildlife in Banff is an expected sight and with this sleigh ride, we have common encounters of elk (sometimes mistaken for reindeer), deer, various rodents and if you’re lucky, a fox or coyote roaming in the grasslands. Some of the Canadian Rockies most famous mountains are Mount Rundle and Cascade Mountain, all of which you’ll get unbeatable views of from your sleigh. The journey starts at Warner Stables and glides through the snowy landscape that is very much unique to this specific region of Banff National Park. 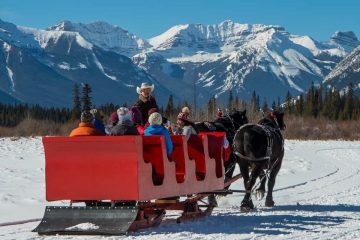 Winter is all about getting cozy and with the Banff Trail Riders sleigh ride, this is exactly the experience you’ll get. Thick blankets, a warm fire, and toasty marshmallows are all included in the sleigh ride with added sparkling wine and chocolates for couples on a private tour. And don’t forget about the timeless stories and local tips from your cowboy or cowgirl guide. After enjoying this quintessential Canadian experience, head over to the Cave & Basin National Historic Site located just down the road on Cave Ave to find out more about the origins of Banff National Park and the birthplace of the Canadian National Parks system. Here you can view natural hot springs bubbling up from the ground both outside along the boardwalk and in the cave. Want to swim in the springs themselves? Continue staying cozy and warm and experience the Banff Upper Hot Springs, one of the best value activities in the park and open until 10 PM on weeknights and 11 PM on weekends.